The Natural Step helps your community judge everything - all of your activities - through the lens of sustainability. Outside your organization you also see that sustainability is showing up as an important economic development issue requiring a more comprehensive and strategic commitment. And when it comes to sustainability, community members and stakeholders are demanding that the municipal government lead by example. By integrating sustainability into the very fabric of your municipal government, you will demonstrate leadership throughout the community and inspire residents and other stakeholders to help further your sustainability plans. The Natural Step Canada can help your municipal corporation embed sustainability into the following areas: governance; operations and facilities; programs and services; relationships; people and team; and your voice. 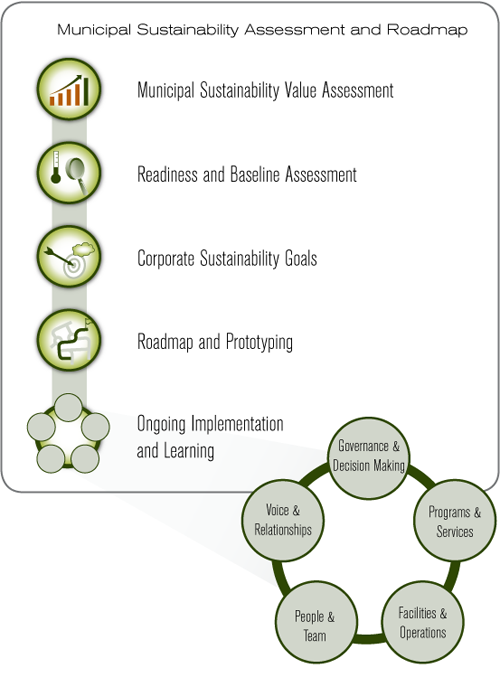 Download a free copy of our Best Practices Scan of Sustainability Decision-Making and Planning for the Municipal Sector and our report on Embedding Sustainability into the Culture of Municipal Government. Engage The Natural Step Canada to deliver a one-day Level 1 sustainability training program for your municipal leaders and staff. Click here. Next: How can we achieve long-term sustainability and resiliency for our community?